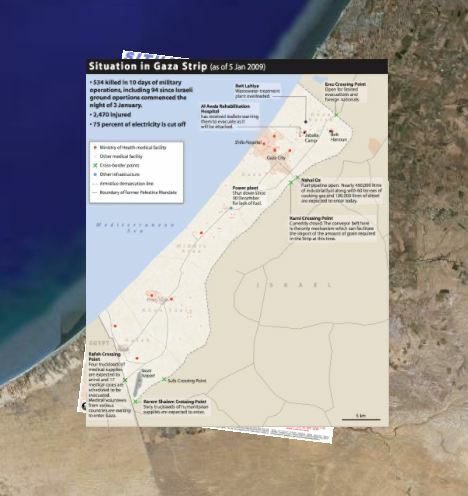 UNOSAT has released an updated version of its Gaza situation map, while OCHA (the UN Office for the Coordination of Humanitarian Affairs) has also released a map focusing on the humanitarian situation. Both maps incorporate information from as recently as yesterday, January 5, 2009. I’ve now also geopositioned the OCHA map. Additionally, I’ve put both overlays into a nested network link and moved all the content to my Dropbox (putting this Ogle Earth post to good use). Here is the result, a single URL that automatically shows the latest versions of both maps. Remember to play with the opacity slider in Google Earth. Should there be further updates to these maps (or other new useful maps made available) then I will simply replace the files via Dropbox and update the KML file. Your network link in Google will automatically show the latest file, without you needing to download it again — either just relaunch Google Earth, or right-click on the folder icon and select “Refresh”. 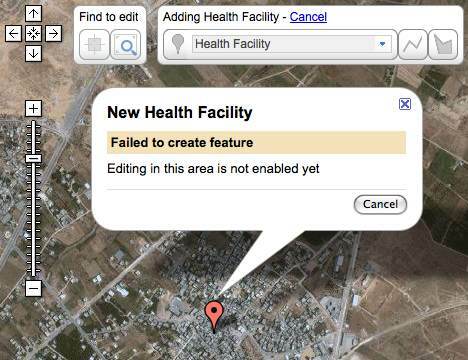 As Aid Worker Daily has shown, online maps of Gaza are sub-par at the moment, though you can help OpenStreetMap build a better map of Gaza right now — Mikel Maron is asking for help. Google’s Ed Parsons lends his support to Mikel’s OSM Gaza effort, in part because Google’s own Map Maker crowdsourcing tool isn’t enabled for Gaza. Yet another reason why it is important to have OSM around.